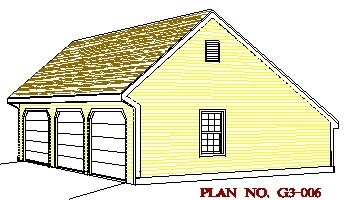 Offering building plans / blueprints for small structures including garages and workshops with loft / living space. Family owned and operated for 3 generations. Detailed construction notes and design data. Electrical, HVAC and plumbing should be installed, to code requirements, by licensed professionals and are not shown. We recommend that you discuss fixtures, outlets, etc. with your builder and subcontractors before construction. You and your builder can determine material substitutions for materials shown on the plans if required. 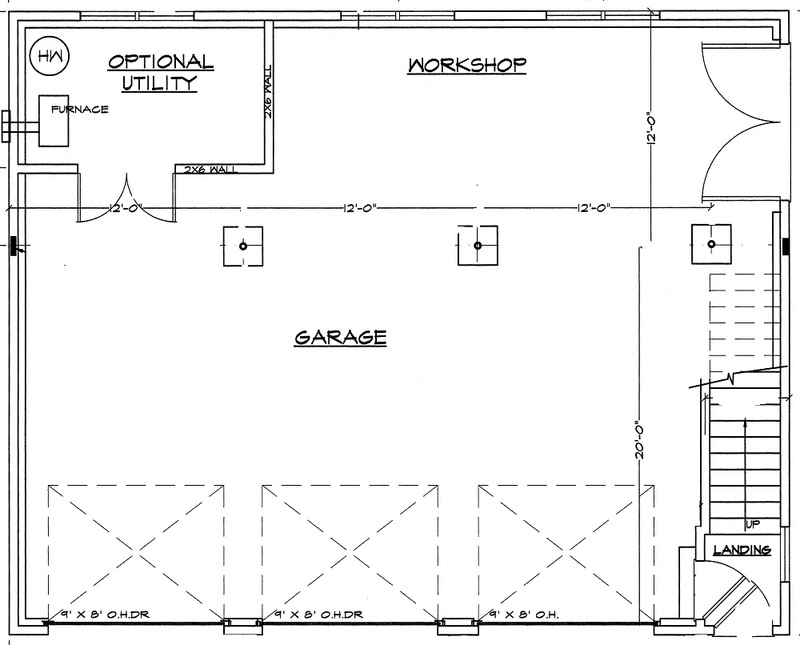 Modifying Plans - Modifications such as relocating windows and doors, changing sizes, etc. can be done prior to construction by your builder. You and your builder should check with you building department for compliance with all local codes and zoning before construction. Building Codes – Our plans are drawn to BOAC and CABO codes and effect at the time they were created. Because codes are subject to frequent change, local requirements, and varying interpretations, we cannot guarantee compliance with any specific codes or requirements. 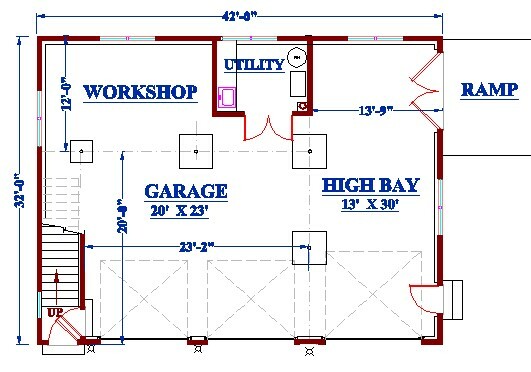 You and your builder and local building department must review and adjust the plans for code requirements prior to construction. You and your builder can determine material substitutions for materials shown on the plans if required. Construction Costs – We cannot do building cost estimate since materials and labor very for different locales and different conditions. You should be able to get free estimates from builders if they know you are serious about building. That's where a good set of plans can help so you know everyone is bidding the same job. Be sure to allow plenty of time for estimates and planning . Estimated done with an adequate time allowance will be more accurate than those which are rushed and include "guess-timates" and "just in case we forget something" numbers. Satisfaction - We make every effort to produce plans that are accurate, understandable, and efficiently planned. If you are dissatisfied for any reason please contact us as soon as possible by phone or e-mail and we will do our best to correct the problem to your satisfaction. 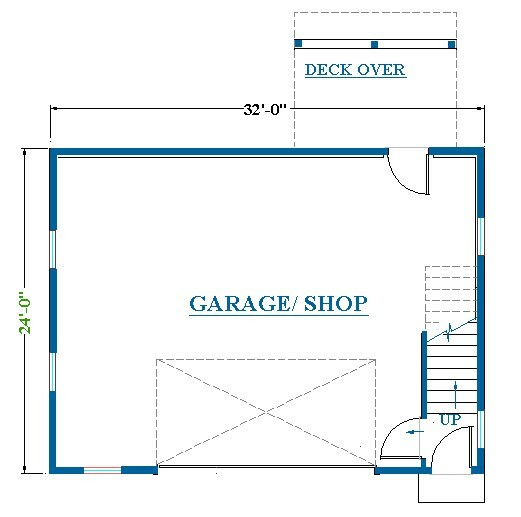 This oversized garage has an extra bay in the rear for a boat or recreational vehicle. Stairs lead to an upstairs loft for storage or work shop. 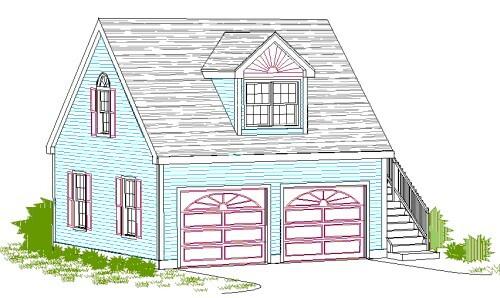 G3-2838B "3 Bay Garage with Loft"
2nd Floor living space without shed dormer = 767 sq. 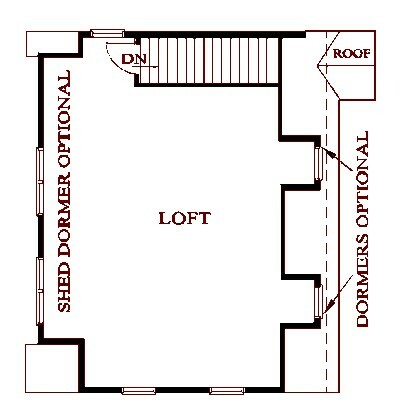 ft.
2nd Floor living space with shed dormer= 887 sq. ft.
Garage overall dimensions are 28' wide x 38' deep. Ceiling is 9'-8" on first floor (slab to underside of floor joists). 3 Over Head Doors are 9' wide by 8' high. 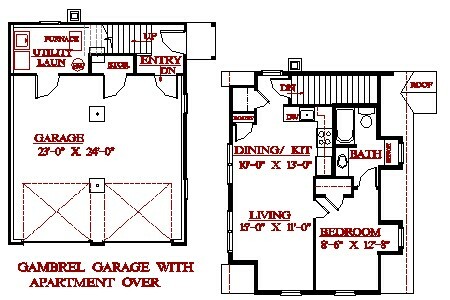 AG-2838B "3 Bay Garage with 2-Bedroom Apartment"
Living space (includes utility)= 892 sq. ft.
1st floor to Ridge = 25' -2 3/4"
Second Floor Apartment has 2 bedrooms, Living/Dining, Kitchen and Bath. Access to apartment with interior stair, with full 7'-6" high ceiling on the second floor. 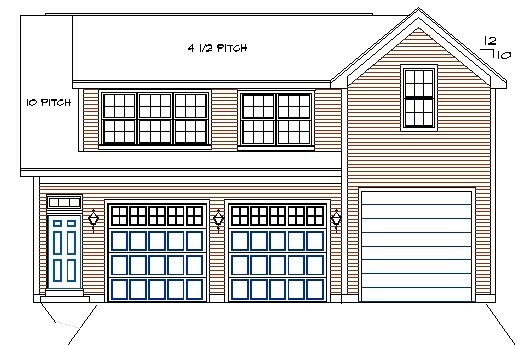 RV-2842B "3 Bay RV Garage With High Rear Bay, Loft, and Upper Rear Attic"
2 front doors are 9' wide and 8' high. Rear, high bay door is 9' wide and 10' high. 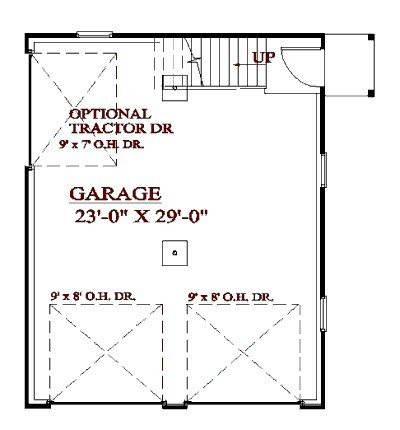 This barn style garage is a good choice when you need a high bay for a mechanics lift, RV parking, a boat, farm or construction equipment storage. High bay rear door is 10'-0" high, ceiling is 13'-0" from slab. 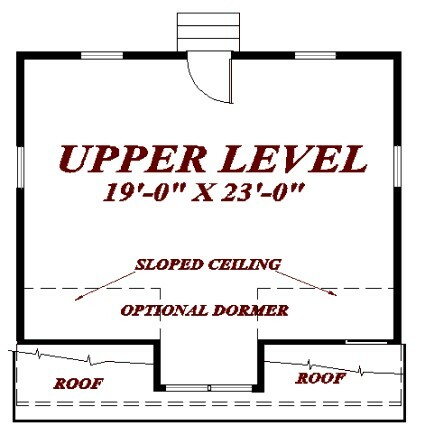 Height from slab to top of ridge (without the cupola) is 25'-2"
Full height ceilings in center area of loft 8'-0" high x 11'-9" wide, total floor 20' wide. 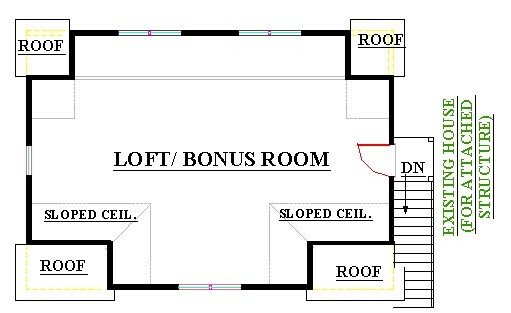 (sloped ceilings are indicated with dotted lines). 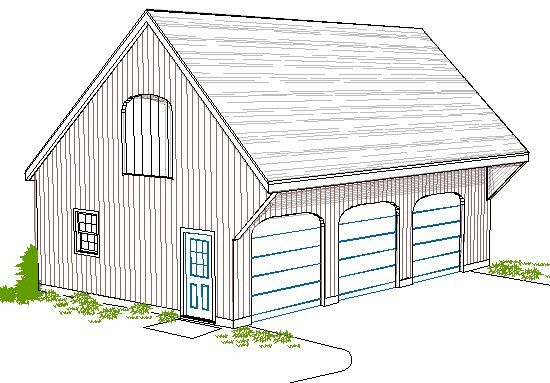 GCH-2432 "Carriage House Garage With Loft Over"
The second floor of this carriage shed design has raised 4' knee walls to give more room for an apartment. Styling goes well with 2 story homes and traditional style homes. Overall dimensions are 32' wide x 24' deep. Second floor loft for storage, hobbies, or whatever. Plan includes optional deck on the rear. Our plans always include all items listed as optional, so that you and your builder may select the ones you want to incorporate in your finished building. 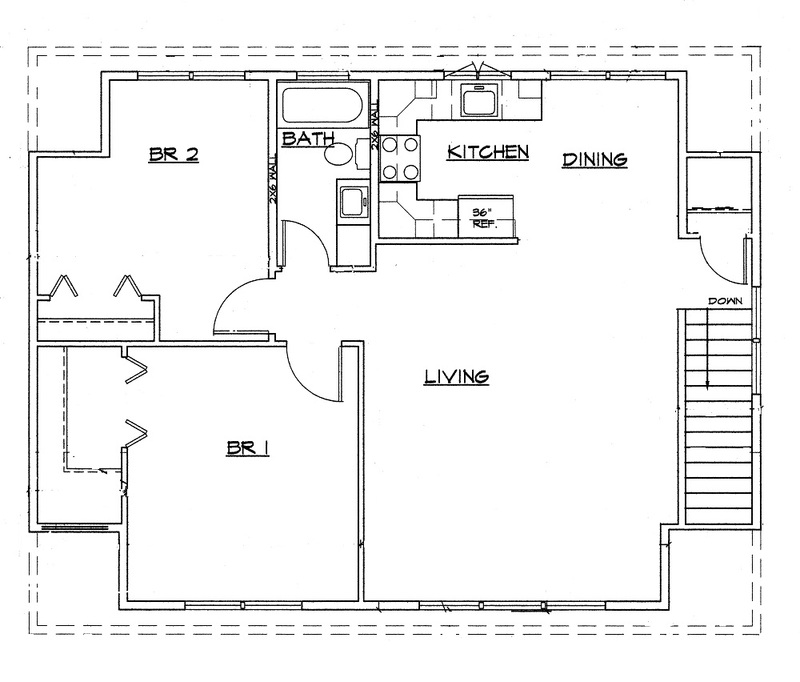 Finished Living Space = 742 sq. 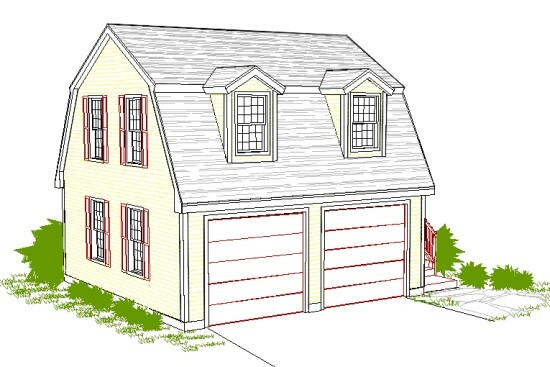 ft.
ACH-2432 "Carriage House Garage With Apartment Over"
First Floor Plan is a good sized 2 bay garage with extra storage and room for a workshop. Second floor is ideal for Mother-in-law, guest quarters or vacation retreat. 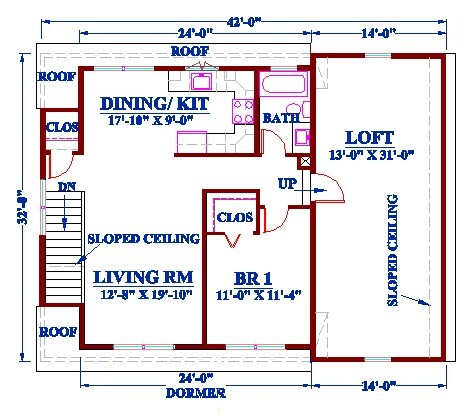 Plan includes optional deck on the rear, 1 bedroom, as shown, or leave the front area open for an extra big great room. 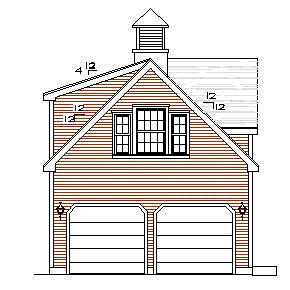 GCH-2428-A "Carriage House Garage With Gable End Door With Loft"
The second floor of this carriage house design has raised 4' knee walls to give more room than our Cape style garages. Overall dimensions are 24' wide x 28' deep. Conventional framing with 2x6 stud walls in living areas, 2x4 in unheated areas. 26'-11" 1st floor slab to top of ridge. 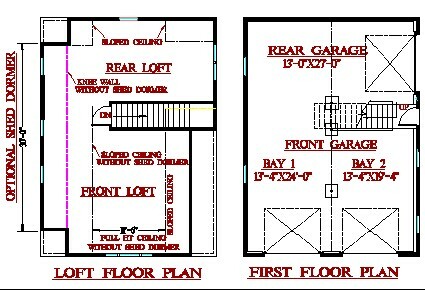 First floor plan is a good sized 23'-4"x23'-4", 2 bay garage with a 3'+ storage area behind the stair. 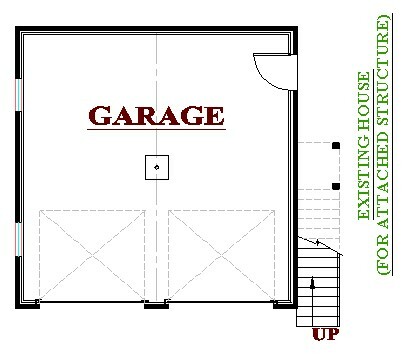 Two overhead doors are 9'-0" wide x 8'-0" high, 3' entry door at foot of the stairs leads to the roomy loft. 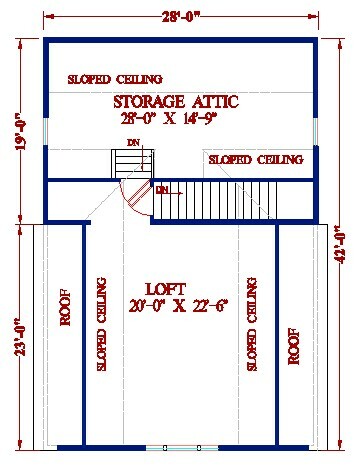 Second floor loft great for Storage, Home Office, Guest Room, or Retreat. 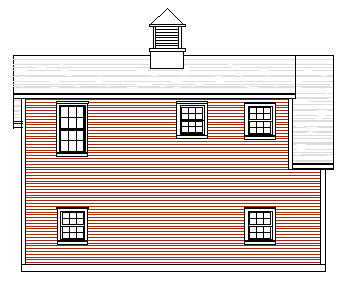 Second Floor includes optional shed dormer on the left, optional double wide A-dormer on the right. Our plans always include all items listed as optional, so that you and your builder may select the ones you want to incorporate in your finished building. 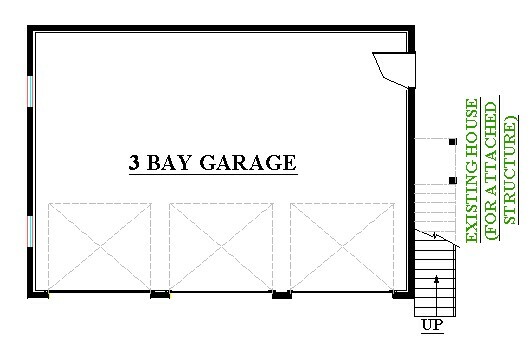 RV-3038-A "High Bay Garage With Loft"
Use for RV, boat or large equipment storage. The second floor over the 2 bay garage has raised 4' knee walls for a comfortable bonus loft area. Styling goes well with 2 story homes and traditional style homes. Over All Dimensions= 30' x 38' Conventional wall framing with 2x6 stud walls. 2nd floor framing engineered I joists. Roof conventional rafters. 25'- 8" 1st floor slab to top of ridge. 8' ceiling at 2nd floor full ht. Note: The high bay is designed for a class C motorhome. Class C ranges in size from 10,000 to 12,000 pound gross vehicle weight and from 20 to 25 feet in length and about 10 feet high. 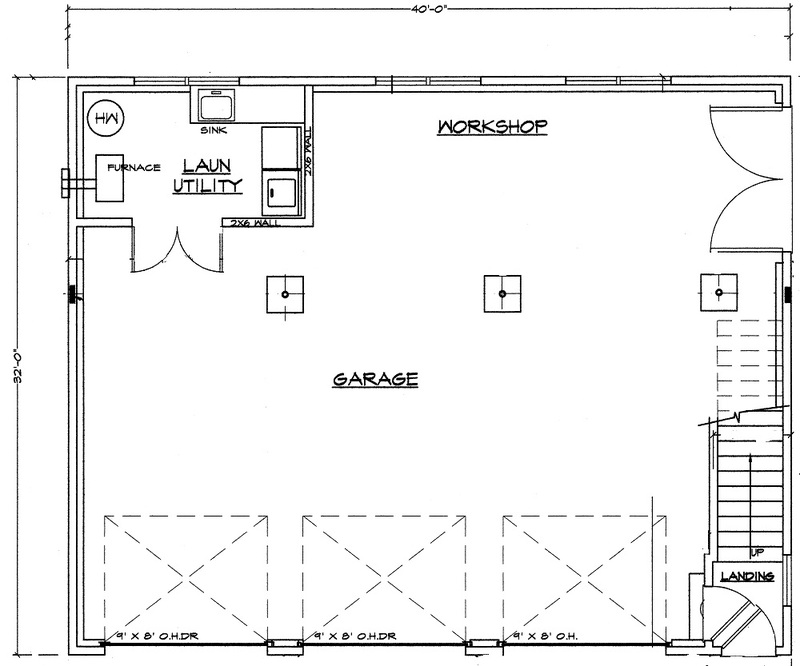 First Floor Plan has a good-sized 24'x25' 2 bay garage with a storage area behind the stair. 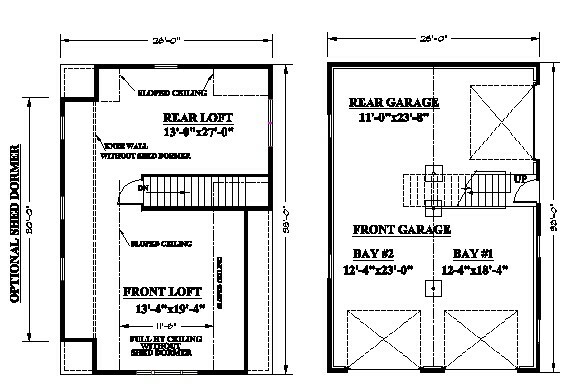 Two overhead doors 9'-0"; wide x 8'-0" high, 3' entry door at foot of the stairs leads to the roomy loft. High bay~ area features a 10'-0" wide x 12'-0" high door and inside clearance of 13'-6", slab to ceiling. 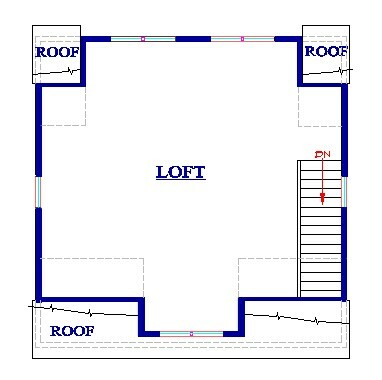 Second floor loft great for Storage, Home Office, Guest Room or Vacation Retreat. Second Floor includes optional A Dormers for extra light. Our plans always include all items listed as optional, so that you and your builder may select the ones you want to incorporate in your finished building. 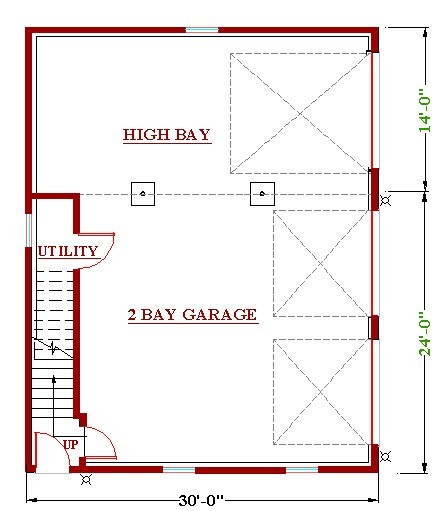 ARV-3038-A "HIgh Bay Garage with Apartment"
Second floor loft great for mother-in law apartment, Older child quarters, guest suite, or vacation retreat. Second Floor includes optional A Dormers for extra light. Our plans always include all items listed as optional, so that you and your builder may select the ones you want to incorporate in your finished building. 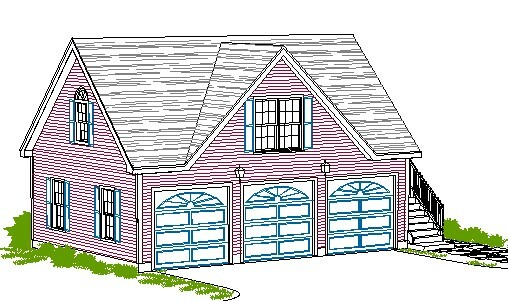 G2-24C-B "Cape Style ~eave side load Garage With Loft"
First Floor Plan is a good sized 24'x24' 2 bay garage. Two overhead doors are 9'-0" wide x 8'-0" high, rear access door is optional. Conventional framing. 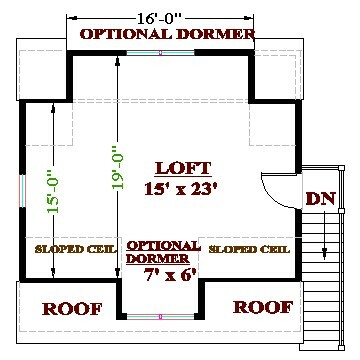 Second floor loft great for Storage, Home Office, Guest Room or Retreat. Second Floor includes optional shed Dormer on Left side, Optional Double A-Dormer on Right. Our plans always include all items listed as optional, so that you and your builder may select the ones you want to incorporate in your finished building. 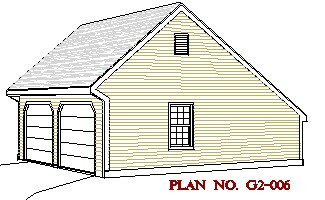 G2-28C-B "Oversized Cape Style Garage With Loft"
First Floor Plan has extra space to allow for a workbench behind the stiars, under the triple windows and lots of strange space along the rear wall. The loft has a separate entry door to give security and privacy to the 2nd floor. 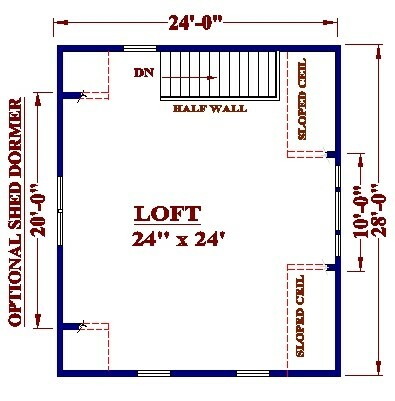 Overall size = 28'-0" x 28'-0"
Second Floor Loft great for Storage, Home Office, Guest Room, or Retreat. Dotted lines show sloped ceilings. Optional double wide A-dormer in front adds space and light. Optional shed dormer in rear adds even more space. Living space in Loft = 550 sq.ft. without dormers. 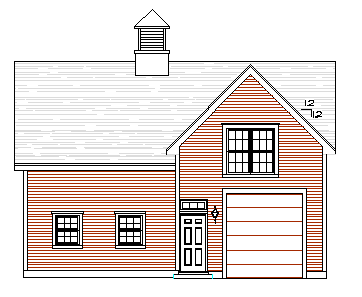 G2-28C-A "Oversized Cape Style Garage Gable End Load With Loft"
First Floor Plan has extra space to allow for a workbench behind the stairs, and extra storage on both sides. The loft has a separate entry door to give security and privacy to the 2nd floor. 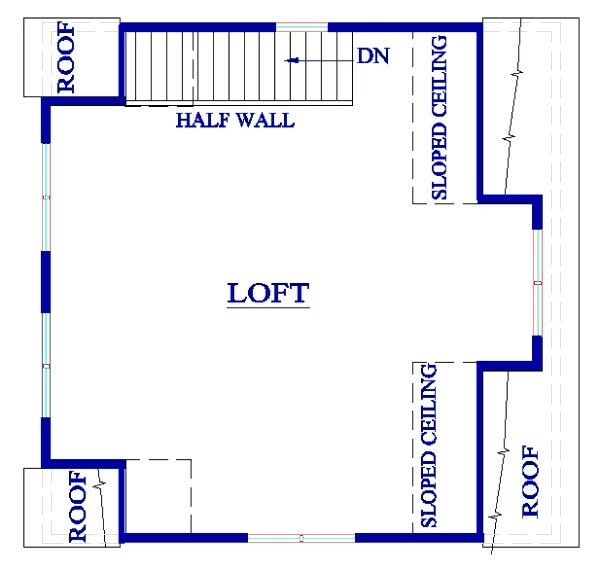 Second floor loft great for Storage, Home Office, Guest Roomor Retreat. Dotted lines show sloped ceilings. Optional Double wide A-Dormer on right side adds space and light. Optional shed dormer on left adds even more space. left shed dormer adds 85 sq.ft. 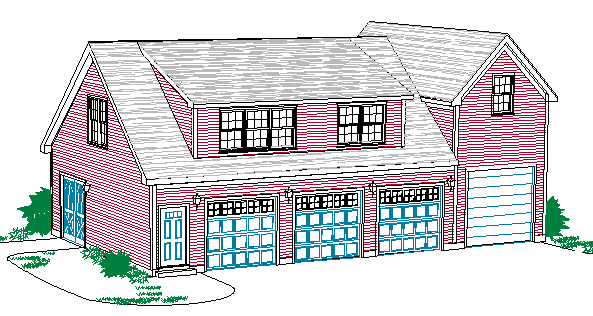 G3-2434C "Cape Cod Style 3 Bay Garage"
First Floor Plan with exterior stair or attach to an existing home. 3 overhead doors are 9'-0" wide x 8'-0" high. Floor framing shows engineered I joists. Roof is conventional framing. 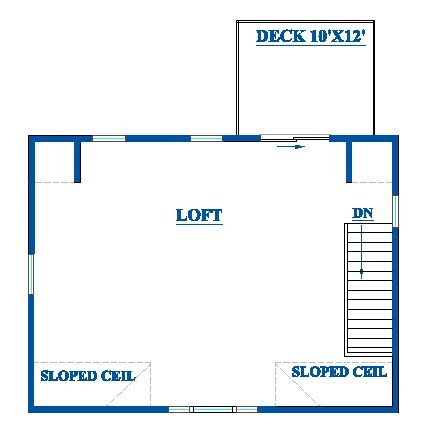 Second floor loft great for Storage, Home Office, Guest Room or Retreat. Optional front gable adds space and light. Rear shed dormer provides extra living space. G3-3240C-SHED "3 Bay Garage with Loft Over"
AG3-3240-C "3 Bay Garage with 2-Bedroom Apartment Over"
Second Floor Apartment has 2 bedrooms, Living / Dining, Kitchen and Full Bath. Access apartment with interior stair. Utility Room on first floor has room for a Laundry. 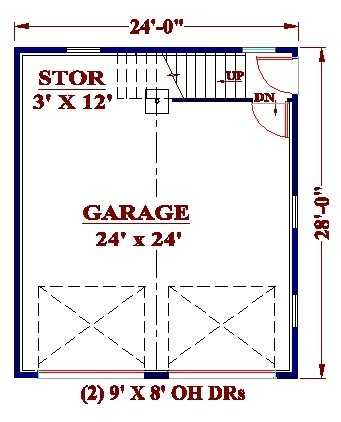 RV3-3242-SHED "High Bay Garage And Workshop w/ Loft Over"
Use for RV, boat, or large equipment storage. 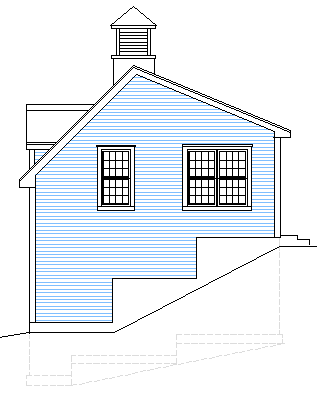 Second floor has a Loft with Shed Dormers front and rear for more usable Space upstairs, attic is great for Storage. 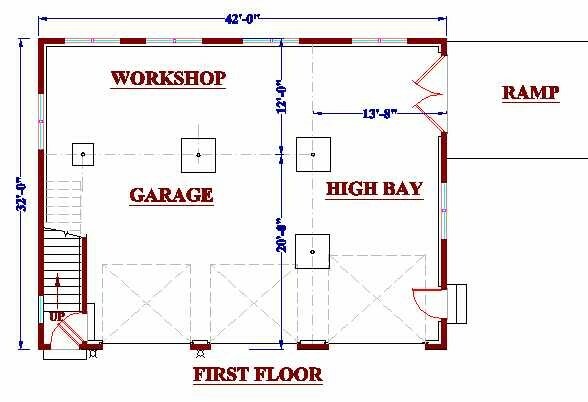 Second Floor has 780 sq. ft. of finished living space. 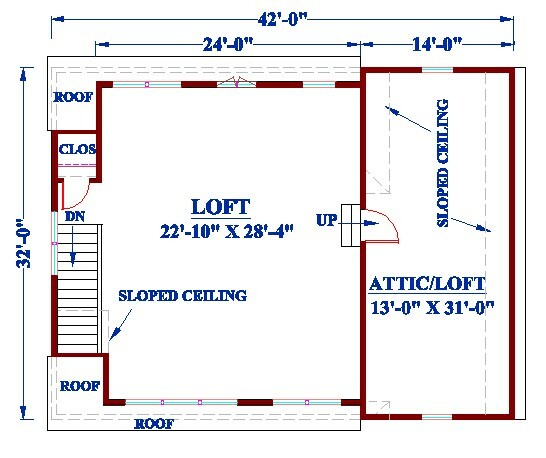 The attic has additional 448 sq. ft. to finish or not. 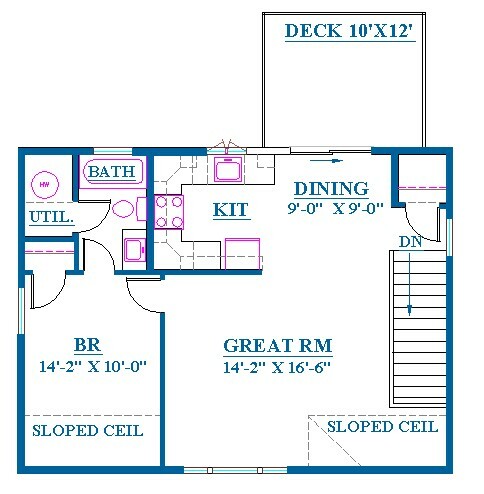 Also available with an apartment upstairs see ARV3-3242-SHED. ARV3-3242-DORM "High Bay Garage and Workshop with Apartment Over"
3 Bay Garage includes a high bay with a 10' high door. Room for a workshop and Utility room in the rear. 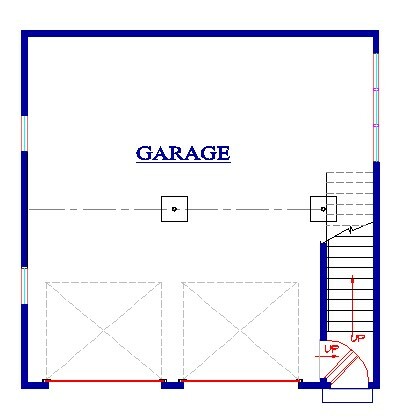 Interior Stair has separate entrance or connects to the garage area. 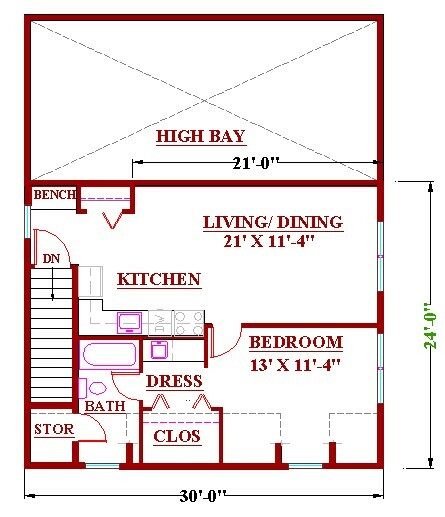 Second floor Apartment has 780 sq. ft. of finished living space. Features 1 bedrooms, kitchen and bath. 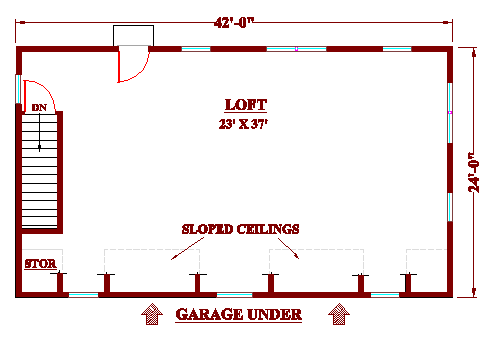 Attic space over high bay, sidewalls are 5'-9" high and the ceiling slopes up to a full 8'-0". 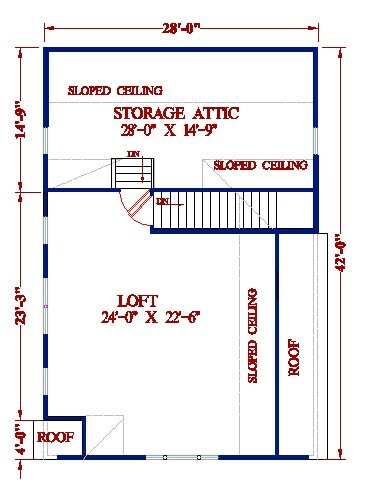 attic with additional 448 sq. ft. is great for Storage or finished off for more living space. The windows are full height egress in the attic area so this could be upgraded to a second bedroom. 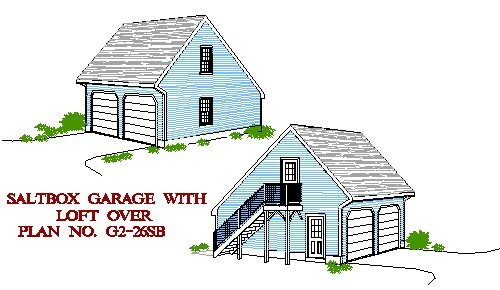 Traditional 2 car garage, 24' x 26', rear access to 2nd floor loft space. 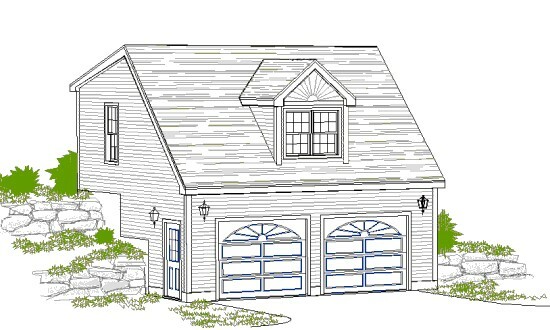 ~ Build into a hill with full foundation in rear ~ The 3' side access door is optional, front dormer is also optional. 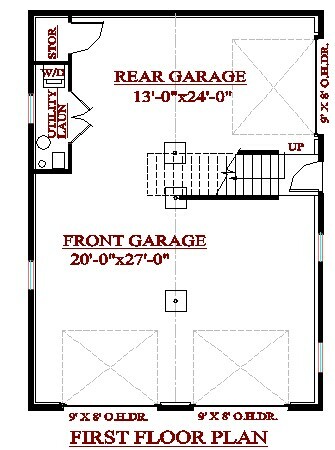 1st Floor garage space = 624 sq.ft. 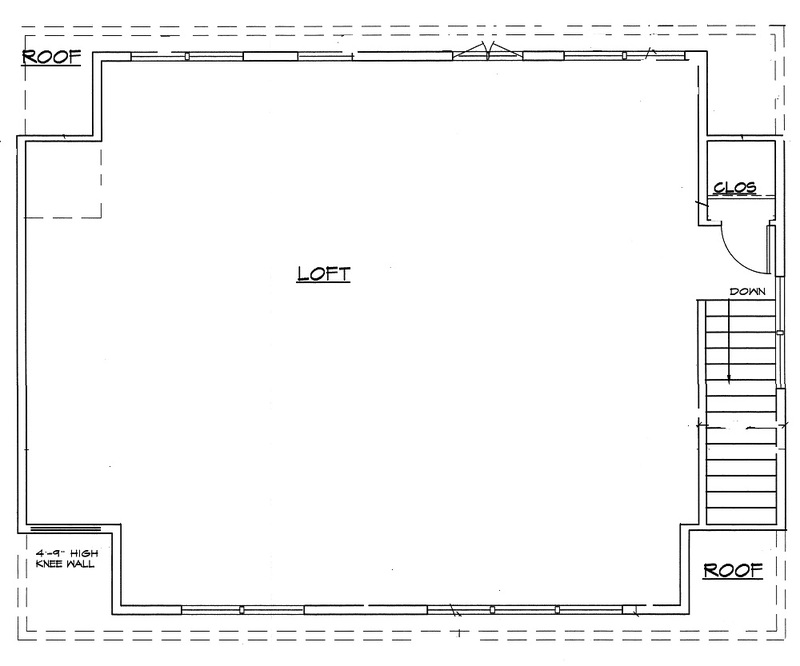 2nd Floor living space = 537 sq.ft. Uphill, rear access to second floor office or shop space. Upper level has plenty of space and light. 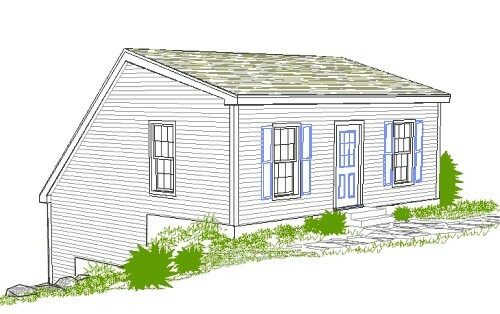 Add the optional dormer for extra space. 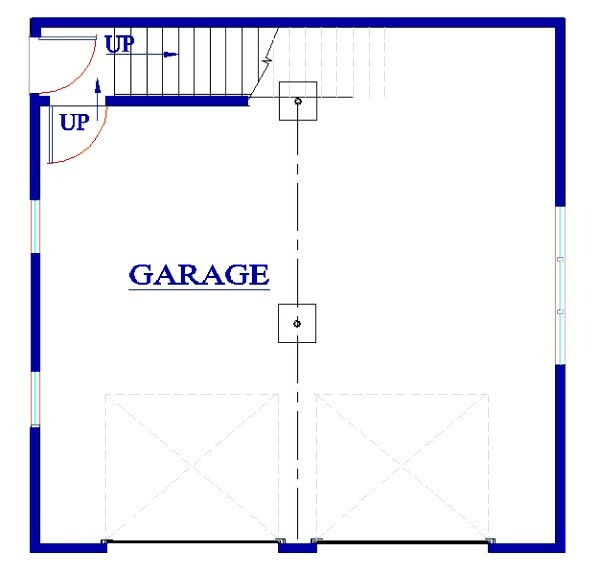 Could be divided into 2 or 3 rooms. 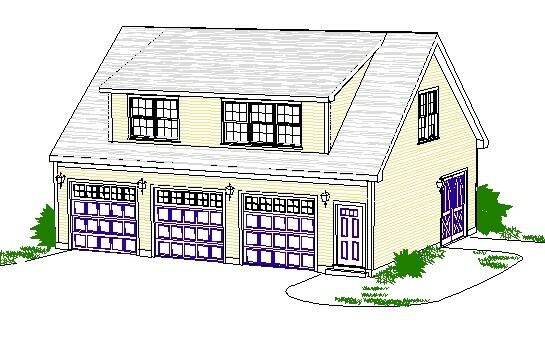 AG3-2442-HILL "3 Bay Hillside Garage w/ Apartment Over"
2nd floor living space = 960 sq. 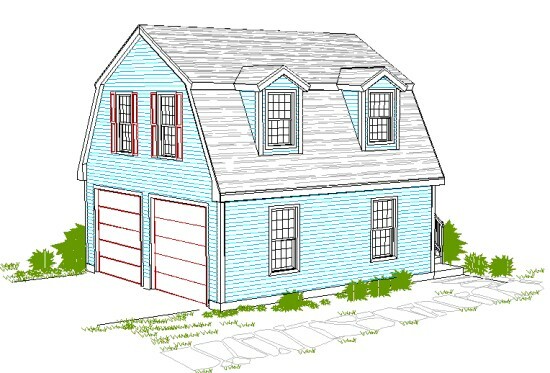 ft.
G3-2442-HILL "3 Bay Hillside Garage w/ Loft Over"
G2-24G-A "Gambrel Gable End Load Garage with Loft"
Shed dormer =56 sq. 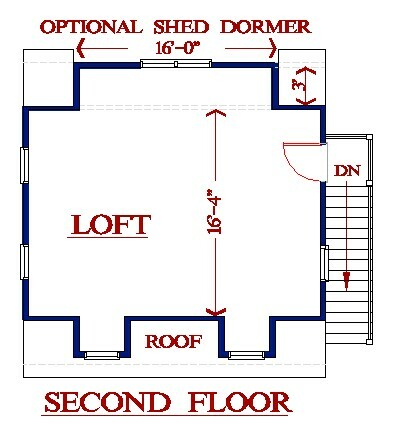 ft.
(2) A-dormers = 26 sq. 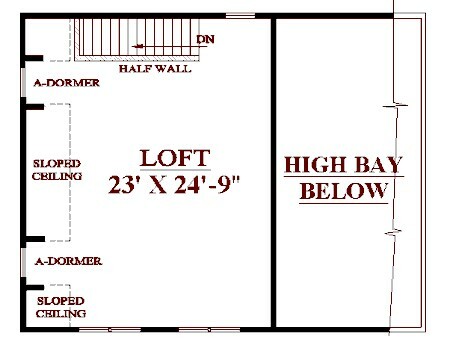 ft.
Second floor loft great for Storage, Home Office, Guest Room or Retreat. Second Floor includes optional shed Dormer on Left side, Optional A-Dormers on Right. Our plans always include all items listed as optional, so that you and your builder may select the ones you want to incorporate in your finished building. 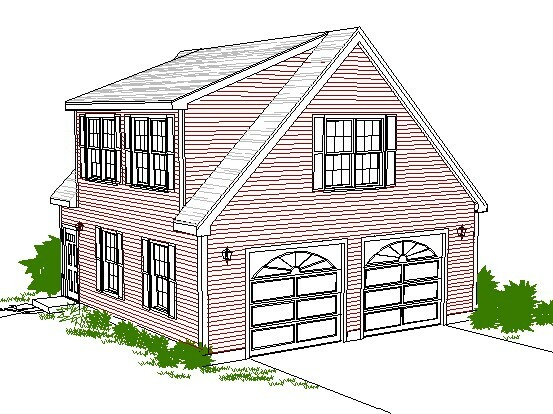 G2-24G-B "Gambrel Side Load Garage with Loft"
G2-2430G "New England Gambrel 2 Bay Garage with Loft"
1st Floor Square Ft. = 720 sq.ft. 2nd Floor Sq. Ft. = 617 sq. ft.
1st Floor to Ridge = 24'-1 1/2"
First Floor is an over-sized 2-bay garage. 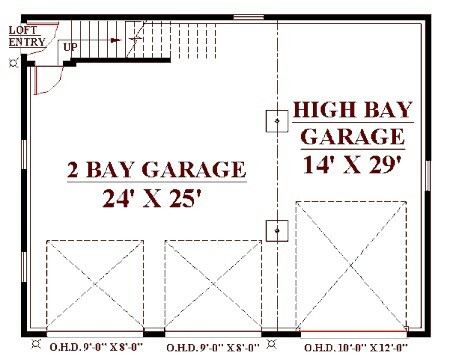 2 Garage doors are 9' wide x 8' high. 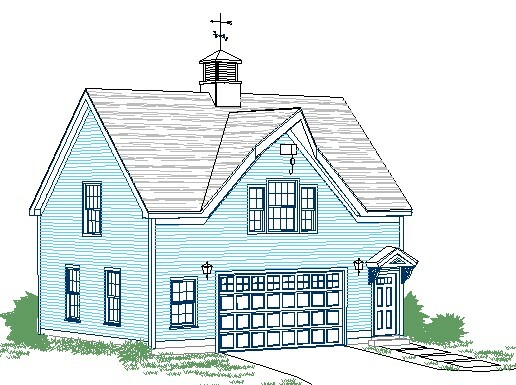 This gambrel garage has a loft upstairs. 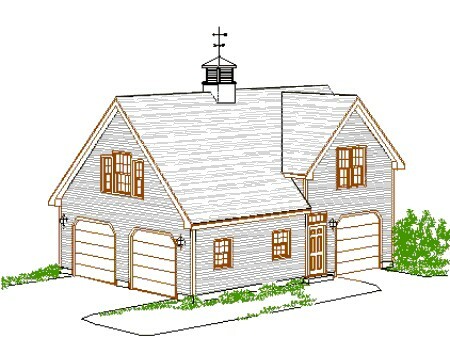 A-Dormers, shed dormer and covered entry porch are optional and are included with the plans. 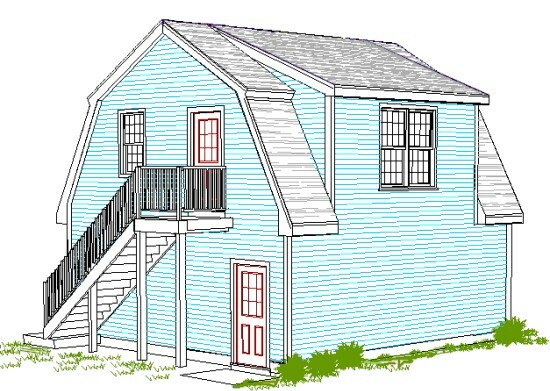 Loft is 16' x 29' (includes stairs) without the shed dormer on one side. Space increases to 20' wide with the shed dormer. 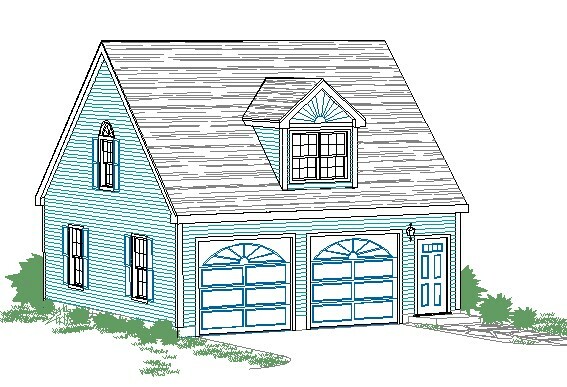 AG2-2430G "New England Gambrel 2 Bay Garage with Apartment Over"
This charming Gambrel Garage has an Apartment upstairs with a convenient First floor Entry. Dormers are optional. 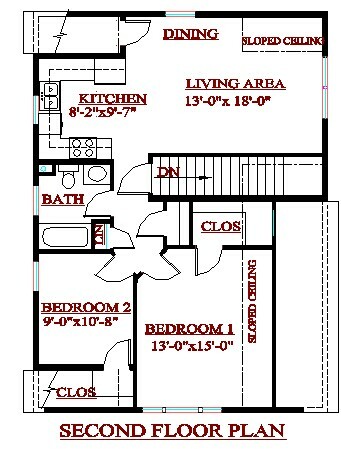 Overall dimensions are 24' x 30', apartment has one Bedroom , full Bath, complete Kitchen. Utility Room on first floor has room for a Laundry. 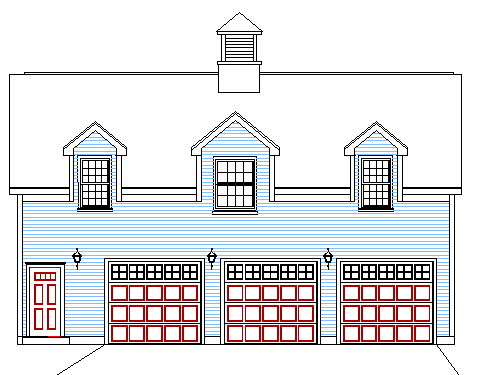 Garage doors are 8' high, first floor ceiling 9'-6", second floor 8'-0"
G3-3044G "New England Gambrel 2 Bay With Workshop And Finished Loft Space"
First Floor is an over-sized 2-bay garage with workshop. 2 Garage doors are 9' wide x 8' high. 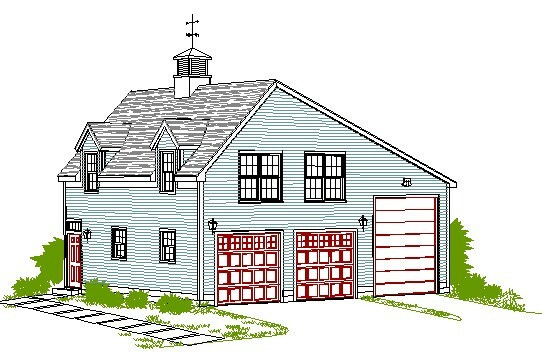 This gambrel garage has a loft upstairs. 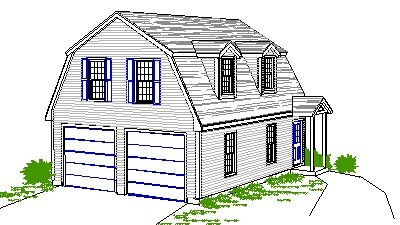 A-Dormers, and covered entry porch are optional and are included with the plans. 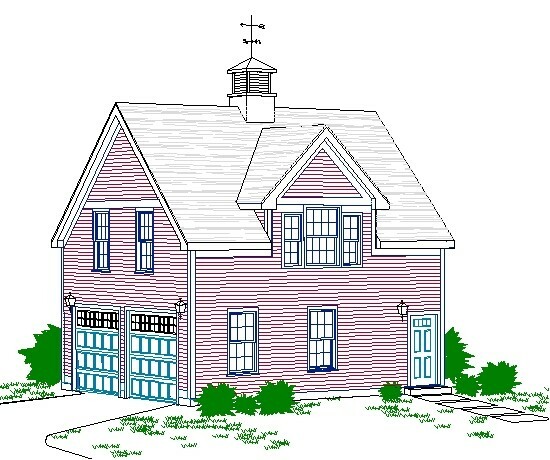 AG3-3044G "New England Gambrel 2 Bay With Workshop And 2 Bedroom Apartment Over"
This charming Gambrel Garage has an Apartment upstairs with a convenient First floor Entry. 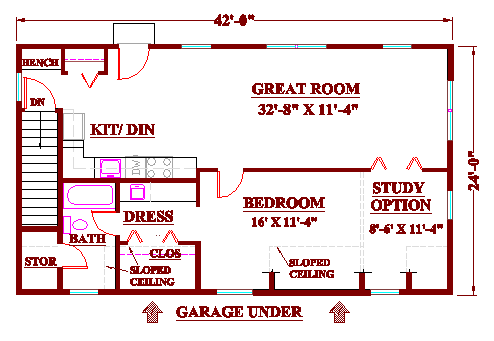 Overall dimensions are 30' x 44', apartment has two bedrooms, full Bath, complete Kitchen. 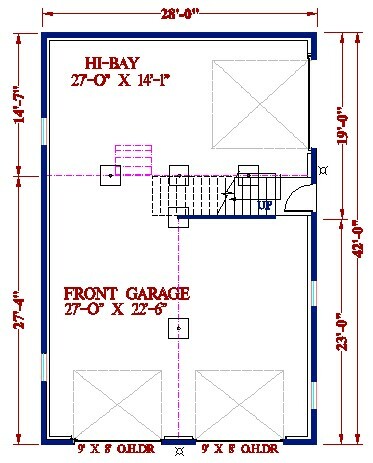 RV4-3254-shed "High Bay Garage and Workshop with Loft over"
Conventional wall framing with 2x6 stud walls. 2nd floor framing engineered I joists. High bay door is 10' wide x 10' high. 3 other doors 9'x9' high. G2-006 "2 Bay Salt Box Garage"
Ceiling is 8'-8" in front area , sloping to 6' in storage section. G3-006 "3-Bay Salt Box Garage"
Over Head Doors are 9' wide by 7' high. 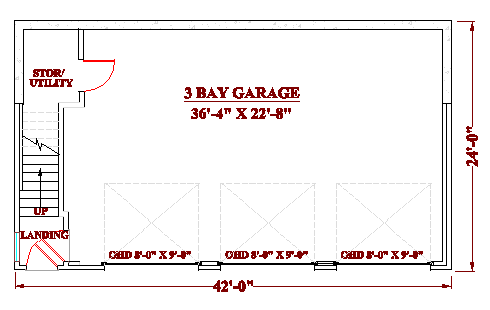 G2-26SB "Salt Box Garages with Lofts"
Overall dimensions are 24' x 26'. 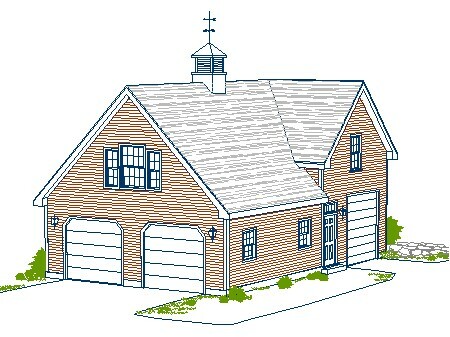 G3-38SB "3-Bay Saltbox Garage with Loft"
This garage works as hard as you do. 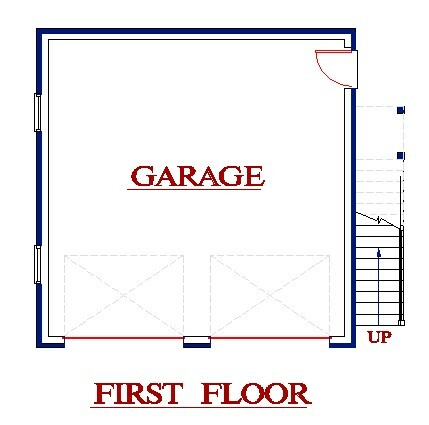 First Floor Plan has a good sized 24'x34' 3 bay garage with extra storage area in front of and under the stair. Three overhead doors are 9'-0" wide x 8'-0" high for pick-up and van parking.